Hungarian rabbi and ritualist; flourished in the fourteenth and fifteenth centuries. He was a pupil of Abraham Klausner of Vienna and of R. Shalom of Neustadt; one of his schoolfellows was Jacob Mölin (MaHaRiL). Grätz concluded that Isaac Tyrnau died before 1427, but David Gans's "Ẓemaḥ Dawid" (p. 65) cites him as living in 1460. Like his teachers and his school-fellow Mölin, Isaac Tyrnau described (in his "Minhagim le-Kol ha-Shanah," Venice, 1616) the customs of different communities using the Ashkenazic rite. The book was translated into German by Simon L. Ginzburg (ed. princeps, Mantua, 1590, and often reprinted). The author has attached to it his treatise on morals entitled "Orḥot Ḥayyim," in 132 sections. Isaac Tyrnau is quoted by Mordecai Jaffa at the end of his "Lebush" on Oraḥ Ḥayyim. 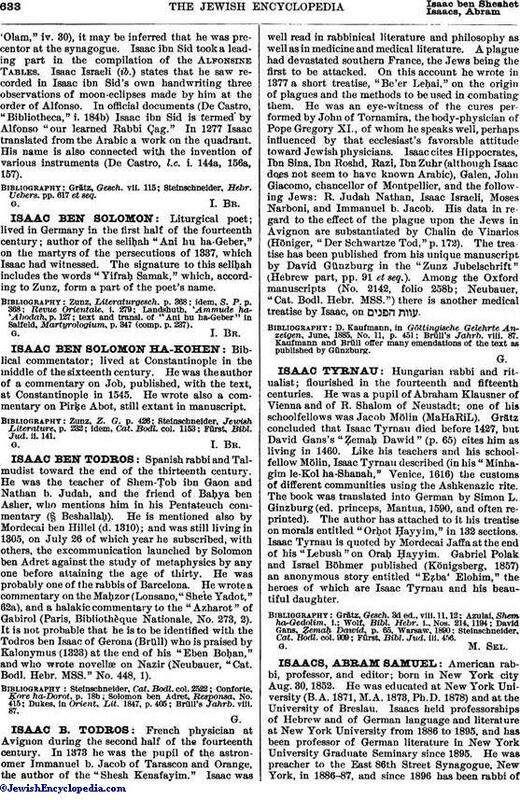 Gabriel Polak and Israel Böhmer published (Königsberg, 1857) an anonymous story entitled "Eẓba' Elohim," the heroes of which are Isaac Tyrnau and his beautiful daughter. Fürst, Bibl. Jud. iii. 456.